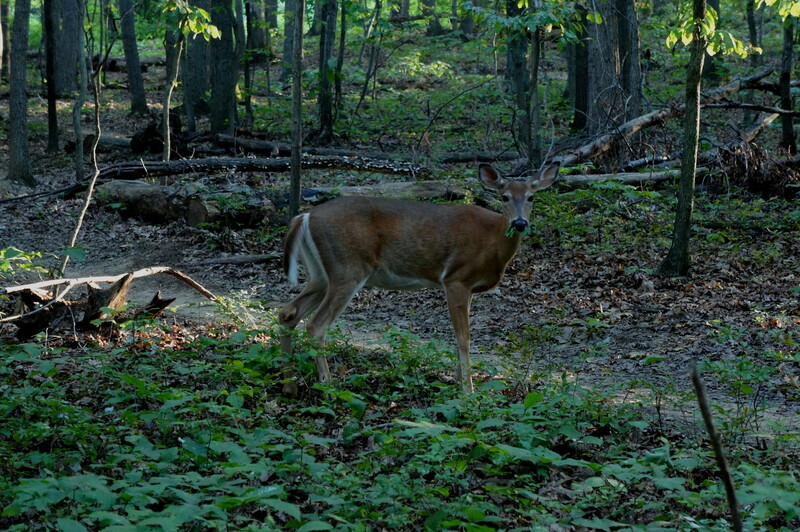 Compared to the stellar hikes of nearby Potomac Gorge or Shenandoah National Park, the South Side-Rails to River Loop in Reston, Virginia’s Lake Fairfax Park is, well, a dud. For hikers, the barrage of mountain bikers whizzing by at high speeds can tarnish the experience. 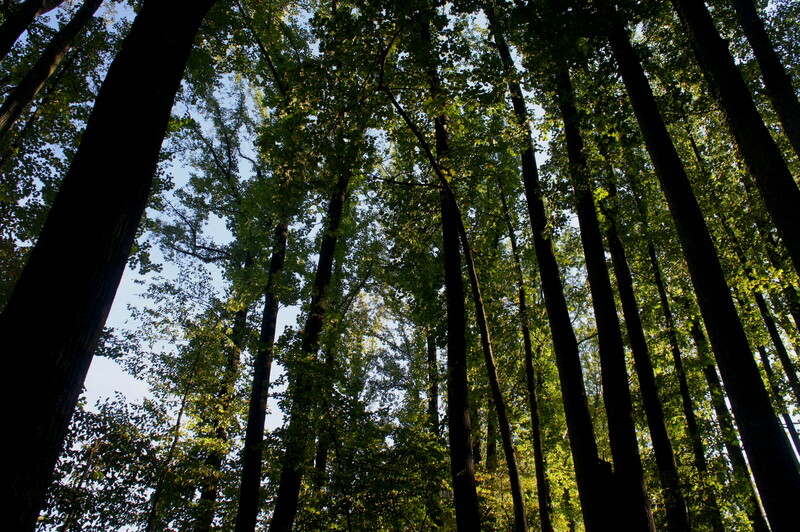 But the hike is at least among woods and within easy walking distance of the Metro, making it a decent choice for city dwellers. 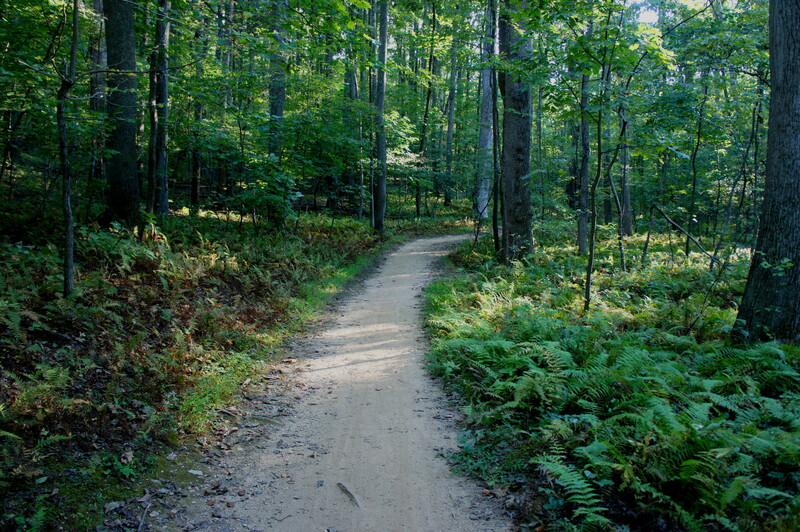 In contrast with other suburban parks, it’s possible in Lake Fairfax Park to escape the noise of vehicle traffic, and fern lovers will enjoy the Rails to River Trail as it follows Colvin Run. As mentioned, a principal advantage of this loop hike is its location near a Washington Metro station, in this case the Wiehle-Reston East stop at the (as of 2015) western end of the Silver Line. From the station, head north on Highway 828 to the popular, paved Washington and Old Dominion Trail (W&OD Trail), then head east until reaching Michael Faraday Court. Turn left (north) onto this dead-end road; for drivers, there is room for three cars at the unmarked start of the Rails to River Trail (opposite the Academy of Christian Education to the west). Here an unmarked—but easily-spotted—pathway cuts into the woods. This trail continues for roughly 30 yards before briefly reemerging onto a blacktop surface. (Note: Additional parking is available just off to the left from here.) From here, look for a wide, dirt track bearing downhill and off to the left. Here the Rails to River Trail continues; it soon enters Lake Fairfax Park. Stop at the modest kiosk on the right for park information and a color trails map. 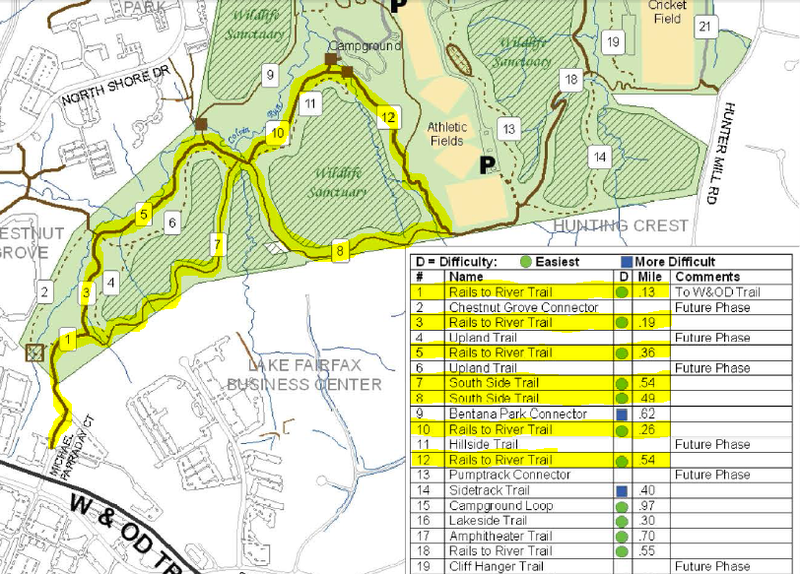 The figure-eight hike described here has two major downsides, the first of which is likely to become evident quite quickly: Lake Fairfax Park is a labyrinth of interconnecting trails, often with poor markings. Carry a map—and follow the directions below! The other disadvantage is that Rails to River Trail in particular requires a good deal of attention, between the sometimes rough terrain and the whirring of mountain bikers, most likely to be barreling down the path at a good clip. Heavy bicycle use has turned the trail surface into dust, or—in bad weather—mud. Hikers may find at least some solace from bikers on the less-frequented South Side Trail, which begins about 1/10 mile from the welcome kiosk. Within a minute past the kiosk, take a right at the three-way trail junction, advancing on a shortcut path (not on the trail map) connecting to the South Side route. Bear right at the subsequent junction. Perhaps the most memorable feature of the South Side Trail is its bizarre shape—it winds, dips, and bends for little apparent reason, except perhaps to provide mountain bikers with more challenging terrain. Man-made mounds along the trail were quite obviously constructed for that purpose. The route also roughly follows the backside of the Lake Fairfax Business Park—including a Lifetime Fitness—making for a less than scintillating setting. By my count, the South Side Trail makes more than a half-dozen turns, including a couple hairpin bends, before leaving the business park behind and bearing northeast through more interesting terrain. Off to the right lies a brushy ravine filled in summer with a green understory—per the map, this area is a “wildlife sanctuary” (read: do not enter; stay on the trail!). Around ¾ mile from the start, the South Side Trail joins the Upland Trail (#6) and Rails to River Trail (#5) at a minor creek crossing. Drop down into the stream bed and cross to the opposite side. 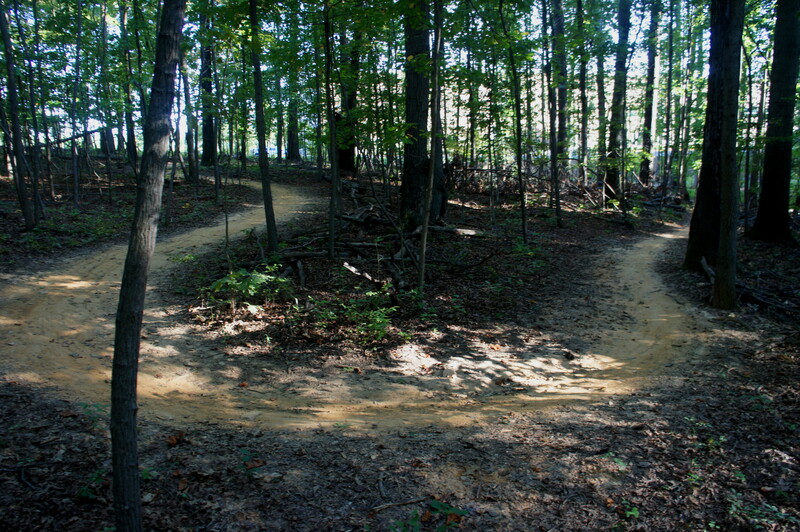 Here you are confronted immediately with another trail fork—stay right to continue on the South Side Trail. Here the South Side Trail is wide and relatively rocky and gains more than 50 feet as it follows the east flank of the ravine to the park’s southern boundary. The border is clearly demarcated by a tall metal fence—beyond which lies a swanky Reston subdivision. The South Side route bears east past fields of ferns and refreshingly old and lofty trees to the next trail junction, a stone’s throw from athletic fields visible up the hill to the northeast. Here the Rails to River Trail has found you again, and the South Side Trail ends. Bear left—away from the athletic fields—cutting through an interesting forest dotted with a handful of uprooted trees. Stay left at the subsequent junction. 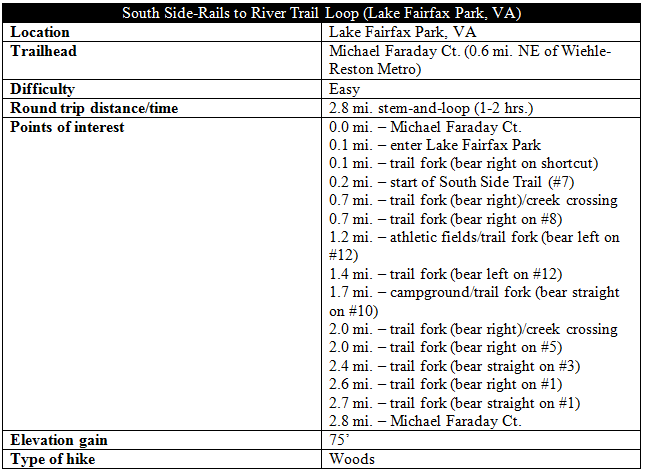 Within a few minutes, the Rails to River route skirts around one of Lake Fairfax Park’s two campgrounds. Just beyond an access point to the campground, cross the hike’s only bridge. Beyond, the path bends west, joining another access trail. The section that follows is a haven for fern-lovers, as the ground is populated with thousands of them. Off to the right lies Colvin Run, but it will take another ½ mile before the creek comes into full view. One-quarter mile from the campground, the trail returns to the spider web of trail connections at the (mostly dry) tributary creek bed. Cross it and bear right on Trail #5—the continuation of Rails to River. Stay straight at the next three-way fork. The trail splits again soon thereafter, but the two paths rejoin within about 50 yards. 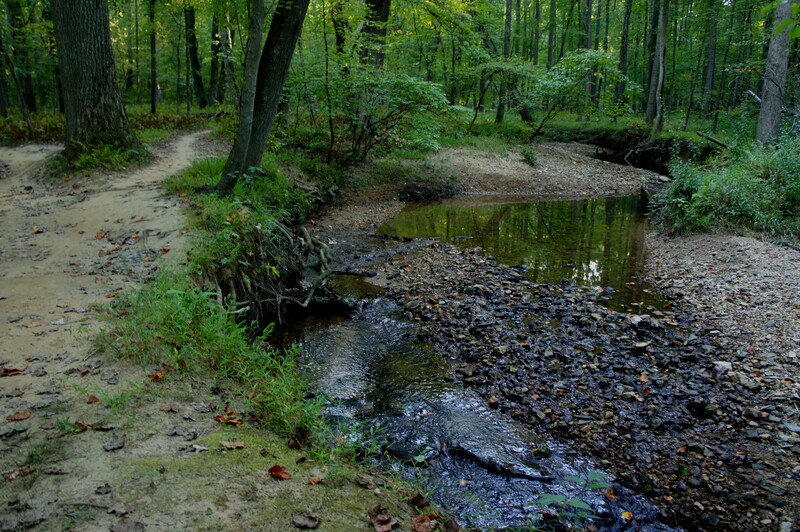 Here Colvin Run is finally visible and probably, in contrast with the park’s other creeks, flowing to some degree. Continuing through fern city, stay straight at the next junction (follow the “3” sign). Shortly beyond lies a poorly concealed old trail—now covered with branches to prevent foot traffic—leading to a forbidden wooden bridge. A few minutes later, the Rails to River Trail returns to familiar territory: the maze marking the start of the South Side Trail. Bear right, staying high above the drainage to the west. Soon enough—after a fair bit of map-gazing, second-guessing, and head-scratching—you are back at the entry kiosk. Return the final 2/10 mile to Michael Faraday Court, adding an extra 6/10 mile for Metro riders. Allot around 1-2 hours for the hike, plus an extra 15 minutes each way to reach Wiehle-Reston if necessary. 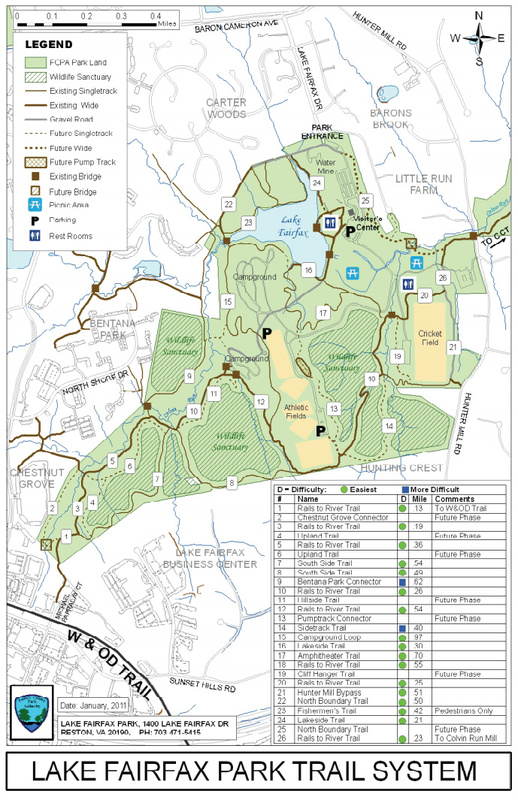 This entry was posted in Easy Hikes, Fairfax County Parks, Virginia and tagged Colvin Run, Lake Fairfax Park, loop hike, Metro-accessible, Michael Faraday Court, mountain biking, Rails to River Trail, Reston, South Side Trail, Virginia. Bookmark the permalink.